New training suites for nursing, midwifery and counselling students are to be dedicated to two heroic nurses who served during the first world war. 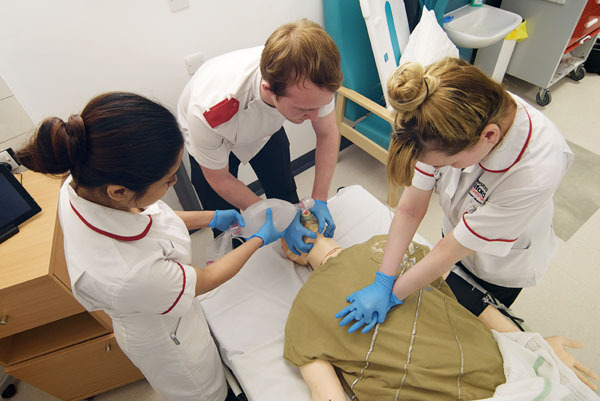 The clinical simulation suites at the University of Salford will be named after Edith Cavell and Minnie Wood following a special ceremony on international nurses day (May 12). Ms Cavell, who was based in Salford during the 1900s when she worked for the Queen’s Nursing Institute, was executed by German forces in 1915 while training nurses in Brussels. Ms Wood trained in Salford and ran a field hospital throughout the war, serving next to the front line in France and Belgium, and then in Germany following the Armistice. She received the honour of the Royal Red Cross for gallantry in the field, as well as being made an OBE in June 1919. The suites, which will be used from September, feature rooms which are designed to look like hospital wards and contain realistic electronic manikins which can be controlled by lecturers or fellow students from an adjoining room. Brian Boag, interim dean of the university’s school of nursing, midwifery, social work and social sciences, said: ‘Minnie Wood and Edith Cavell were both incredibly important figures who risked everything to help others – and in the case of Edith Cavell, paid the ultimate sacrifice.